Chinese New Year starts on 5 February and runs until 19 February. 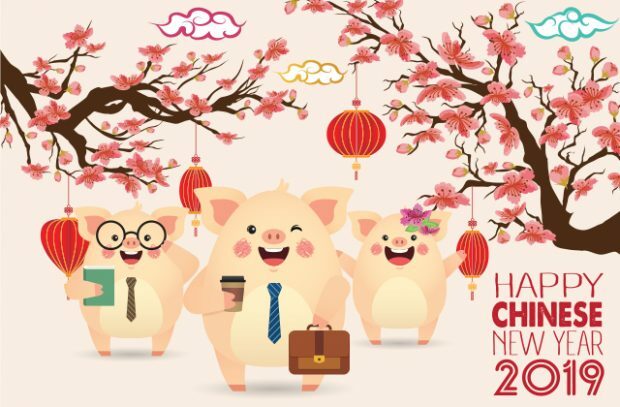 According to the Chinese 12-year animal zodiac cycle, 2019 is Year of the Pig. Years of the Pig include 1935, 1947, 1959, 1971, 1983, 1995, 2007, 2019, and 2031. If you were born in a pig year, you're known as a pig or 'belonging to the pig' in China. Are you a pig? If so, you might want to include the numbers 2, 5 and 8 on your next lottery ticket, as these are your lucky numbers. Make sure you're wearing yellow, grey, brown or gold when you buy that winning ticket, as these are your lucky colours! According to Chinese culture, if you're a pig interested in business, the advice to you this year is that you should be braver and take small risks in investments. Thinking about setting up your own business? Do so, and after some small obstacles, the road to wealth will be smooth. Once you've decided that this is the year that you're going to set up your own business, don't just jump into it with both trotters. Do your market research, write your business plan and cashflow forecast, and decide what type of business structure you want to be. Then (hopefully) you'll bring home the bacon. Pigs are described as gentle people that rarely lose their temper and want everyone to live in harmony. They're also very tolerant, patient and understanding. Because of this, they're suitable for careers and businesses related to charity and fundraisers. Some of the most common business structures are sole traders, partnerships and limited liability partnerships. The CIC regulator has guidance on CICs, including the forms you need to set one up. As part of our business stories series, we recently visited The Eco Larder CIC, based in Edinburgh, Scotland. Run by Matthew and Stephanie Foulds, they're Edinburgh's first zero waste shop. They decided to set up the Eco Larder to make it easier for the local community to reduce their plastic waste footprint. The shop is dedicated to being totally package-free and they stock items that assist with living a zero-waste lifestyle, such as bamboo toothbrushes and cloth bags. The company puts any profits towards environmental charities and local clean-up missions. They also arrange community events such as local beach clean ups and educational workshops about living a plastic free lifestyle. Their ethos is to put planet and purpose before profits and they want to create a passionate and committed community to fight plastic pollution. You can watch Matthew and Stephanie tell us why they chose to set up as a CIC on YouTube (with captions). Good luck to all the pigs who are thinking about setting up a social, charitable or community-based business in 2019. Oink oink! The article was really interesting and very informative. Well done! Thanks for your feedback, Rachel. +red envelopes to whoever created that piggy image! Wonderful idea! More people should be considering eco friendly business.